A collision is such an interaction of entities during which one body bumps into another one, and after remarkably short period of time their velocities changes. The line of collision is the line that is normal to surfaces of both interacted entities and goes through the collision point (see Fig. 1 - rigid balls collision). 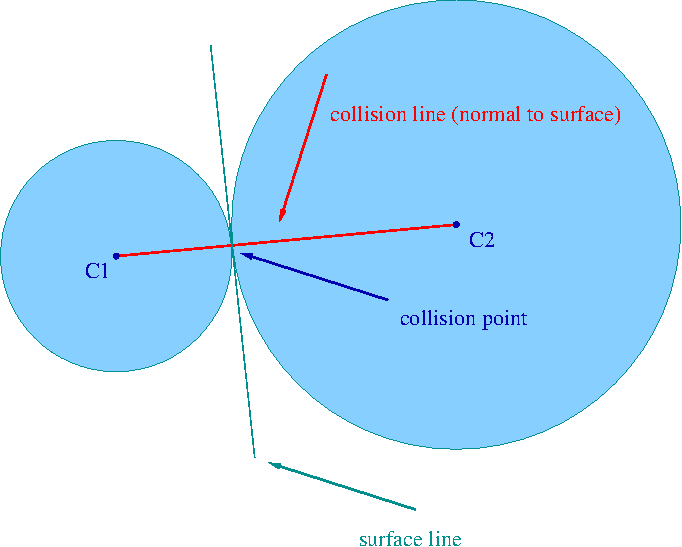 A collision is called the central collision if at the moment of collision mass centres (C1 and C2) of both interacting entities lies on the collision line. A collision is called the simple collision if before the collision velocities (v1 and v2) of both interacting entities are parallel to the collision line. During a collision a system of interacting entities forms a closed system (in approximation). It means that momentum, rotational momentum and energy of the system are conserved. A closed system is a system that does not interact with external entities i. e. entities outside the system and no external force acts upon the system. L = r &cross; p.
where the vector r links the point O with the small mass element of the body (dm where m denotes total mass of the body). And the vector v is velocity of this mass element given by v = ω &cross; r.
where the vector rC is the vector linking the body mass centre with the immobile point O and the momentum vector p is the body momentum in the inertial system of coordinates (see Fig. 2 - systems of coordinates). Energy E is a scalar quantity being a general measure of various forms of motion considered in physics. Energy of a system describes this system in respect to possible changes of motion. These changes occurred due to interactions between parts of the system or interactions between the system and external environment. where Ek is kinematic energy (energy of motion) and Ep is potential energy of various interactions (i. e. interactions between system entities and between system entities and external world). Law of the Conservation of Momentum. It gives that p (vector!) is constant. The considered conservation law is an implication of Newton's laws of motion because the rate of change of momentum in time equals the external net force acting upon a closed system. As it has been written, the net external force acting upon a closed system is 0. Law of the Conservation of Rotational Momentum. It gives that L (vector!) is constant. It means that, for instance, the rotational momentum of ball in relation to its mass centre does not change in time. 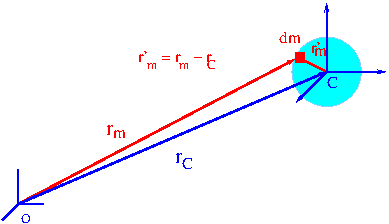 The considered conservation law is an implication of Newton's laws of motion because the rate of change of rotational momentum in time equals torque of the external net force acting upon a closed system. As it has been written, the net external force acting upon a closed system is 0. Law of the Conservation of Mechanical Energy. Mechanical energy Em of a closed system is conserved (i. e. does not change in time) if no internal non – potential forces present in this system do work.